The idea behind this quartet's creation came to Simon Cowell after listening to Andrea Bocelli and Sarah Brightman's rendition of "Con Te Partir&ograve;." He realized he loved lyrical voices but not opera, so he decided to form a multinational quartet (France, Switzerland, Spain, and United States) that sounded like The Three Tenors but sang pop songs and looked like handsome Armani models. With this idea, Cowell commenced a worldwide search for young singers who were willing to embark on the Il Divo project. His search lasted two years, from 2001 until December 2003, when the fourth member of Il Divo, American tenor David Miller, was signed. The well-established formation of Il Divo comprises a renowned Spanish opera and zarzuela baritone, Carlos Mar?n, a French pop singer, S?bastien Izambard, and two classically trained tenors, Swiss Urs B?hler and American David Miller. Recording of their first album started in the first half of 2004 in Sweden. The group's debut album, the self-named Il Divo, contains renditions of Frank Sinatra's hit "My Way (A Mi Manera)," Toni Braxton's hit "Unbreak My Heart (Regresa A Mi)," an adaptation of Ennio Morricone's soundtrack titled "Gabriel's Oboe" from the movie La Misi?n titled "Nella Fantasia" and several songs sung in Spanish, English, Italian, and Portuguese ("Volta Pra Mim"), including 1994's San Remo Festival winner "Passer&agrave;." Il Divo hit the #1 slot on both Amazon.com and BarnesandNoble.com after a breakout career-defining appearance on The Oprah Winfrey Show on April 5, 2005, where the quartet performed its interpretation of "Unbreak My Heart." In the United Kingdom, the Il Divo album topped Robbie Williams as number 1 in the UK charts (allegedly Williams said to them during the Bridget Jones: The Edge of Reason film premiere, "Oi, you're the bastards that knocked me off!"). This multiplatinum-selling CD became number one in the charts in a total of 13 countries around the world, and achieved top 5 placing in 25 countries. Il Divo's second album, Ancora, was recorded in both Sweden and London with world-renowned recording giants Per Magnusson and David Kreuger and producer Steve Mac, who was also the producer of their first album. Released on November 7, 2005 in the UK, it hit number one both in the UK and Australia within one week. Ancora was released in the US on January 24, 2006. It entered the Billboard albums chart at number 1, selling more than 150,000 copies during its first week of sales. Highlights on Ancora include "Isabel," "I Believe In You," a duet with C?line Dion, and Il Divo's cover of Eric Carmen's "All By Myself (Solo Otra Vez)." Two of the tracks on this CD, "O Holy Night" and "Ave Maria," appear on the 2005 US-only release, Christmas Collection. 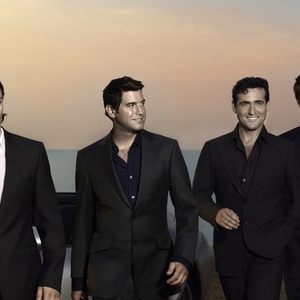 Il Divo was the perfomer of the 2006 FIFA World Cup official song "A Time of our Lives."